Combine the iconic Avalon Hollywood and a constantly evolving roster of boundary-pushing electronic acts and you've got the recipe for CONTROL LA. Born in 2008, the weekly phenomenon stands as the longest running nightlife party in the states and maintains its ground-breaking music programming by showcasing the strongest up-and-comers with festival headliner potential. Previous years have seen the likes of an early Skrillex, along with acts like young Zedd, Wolfgang Gartner, Porter Robinson and a pre-"Turn Down For What" DJ Snake all having graced the CONTROL stage, it's safe to say the Friday event is the premiere stop for DJ prodigies. CONTROL has sounds for everyone, diversifying its lineup with an array of hip-hop artists including Mystikal, Zaytoven, and DJ Premier. Each CONTROL LA lineup is invariably ahead of the curve and adds to the over 4,000 bands and DJs who have already performed at the renowned event. 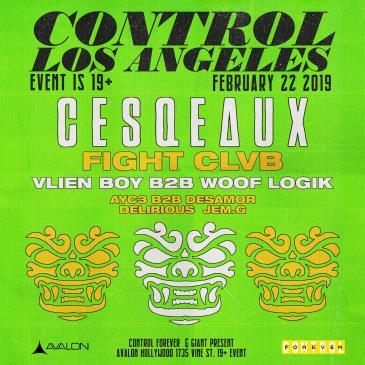 On Friday, February 22nd, take a step into AVALON Hollywood and prepare yourselves for an epic night soundtracked by the musical talent of Cesqeaux, FIGHT CLVB, Vlien Boy b2b Woof Logik, and more. One might describe Cesqeaux as the complete package. He’s a producer, a DJ, and a singer-songwriter. This passion-fueled Dutch-Indonesian artist practically had music ingrained in his DNA. He began playing drums at the young age of seven and from that time on, he continued to progressively dive into the music industry. He’s seen great success in his work with Yellow Claw, Major Lazer, David Guetta, and Justin Bieber. In 2017, he released his trap-fueled ‘The Infamous EP’ on Mad Decent and since then he’s been touring the world and making his presence known wherever he goes. Next, we’ll be welcoming FIGHT CLVB to the stage for some heavy electro house. They’ve gained support from the likes of Afrojack, Boys Noize, DJ Snake, Mercer, and more. They bring dynamic elements to the table with their varying backgrounds. When a talented producer/visual content creator and a multifaceted masked mystery man come together to create, it’s sure to be a wild ride like you’ve never heard before. We’ll also have Vlien Boy and Woof Logik will be giving us a special b2b treat for this edition of CONTROL. To warm things up, AYC3 with be going b2b with Desmor and we’ll hear some great beats coming from Delirious and Jem.G. Tickets are on sale now! 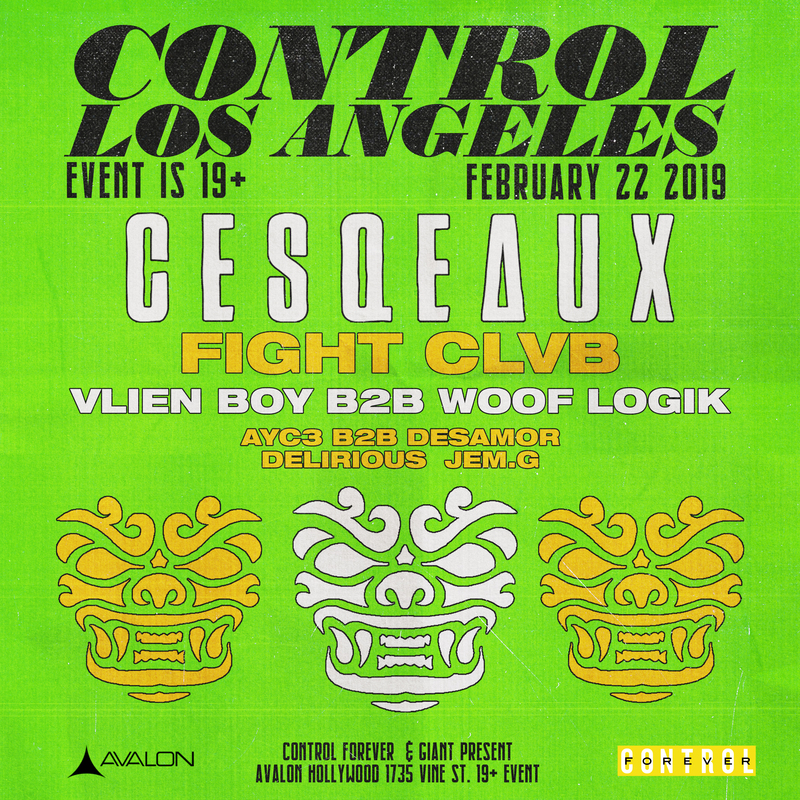 Make sure to snag yours so you can join in on the action Friday, February 22nd, at AVALON Hollywood with Cesqeaux, FIGHT CLVB, Vlien Boy b2b Woof Logik, AYC3 b2b Desmor, Delirious, and Jem.G.